Earn 1795 loyalty points when you order this item. 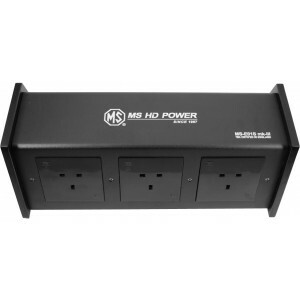 MS HD Power MS-E01S Mk2 Filtered Mains Block features 78K cryogenic treatment. This model features a multi-stage A/C line filter with PRRT noise suppressor. There are 6 premium grade sockets with high spring rate phosphor bronze clips to assure a tight connection. 1.0 µm rhodium plating to all power clips and IEC inlet affords the block purified signals transmission. Heavy duty power transmission bus bars with 1.0µm pure silver plating is designed to enhance high current flow. Star-wiring circuitry is included to minimise cross interference between components while a type-C14 IEC inlet adapts to user-selected power cords. A 96,000 amp with surge suppression protects Hi-Fi/AV appliances. Super heavy gauge metallic chassis is adopted along with spikes for vibration absorption. A Rapid response resettable safety switch protects equipment connected and MS-E01S MK2 is fully approved by BSI and complies with BS-1363/A and BS-5733/A standards.